Testicular mesothelioma, also known as mesothelioma of the tunica vaginalis testis, is the most rare form of the cancer, accounting for only about 1% of all cases. Testicular mesothelioma is the rarest form of the already rare cancer. It may be caused by asbestos exposure, as well as a number of other risk factors. Best treatment practices are unknown, though surgery is often an option. On average, testicular mesothelioma patients live 20 – 23 months. Testicular mesothelioma develops in the membrane that lines the testicles, the tunica vaginalis. It is the rarest form of mesothelioma, with only about 100 reported cases. Because of its rarity, researchers do not understand well how testicular mesothelioma develops and might progress in the body or best treatment practices. Despite the lack of clinical evidence around the disease, patients typically have a better prognosis than those diagnosed with pleural mesothelioma. 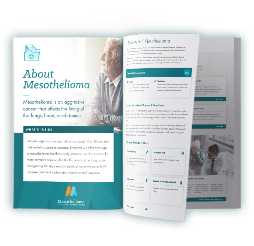 The three main types of mesothelioma are commonly linked to asbestos exposure, but the connection isn’t as clear with testicular mesothelioma. In fact, various studies have found that patients diagnosed with this rare form of the asbestos cancer have no history of asbestos exposure, with some researchers suggesting that only about 41% of testicular mesothelioma cases can be attributed to the toxin. For the cases that can be linked to asbestos, there is no clear evidence for how the asbestos fibers reached the testicles. In some instances, testicular mesothelioma may actually be a site of metastasis from primary peritoneal mesothelioma, which develops in the lining of the abdomen. There have been no documented instances of secondary tumors developing in the tunica vaginalis as a result of malignant pleural mesothelioma, but researchers haven’t ruled out the possibility. With the limited number of cases, researchers have also been able to identify a handful of other risk factors and potential causes of testicular mesothelioma. As with other forms of the disease, malignant mesothelioma of the tunica vaginalis does not have specific symptoms that can aid early detection. In most instances, a diagnosis has been made incidentally during a standard physical exam or another surgical procedure. In the few studies available, researchers have noted many patients are asymptomatic or the common symptoms aren’t noticeable enough to seek medical help early on. For patients who do present symptoms, studies have found about 56% experience hydrocele and another 33% have a lump or mass on the testes. Like with any form of mesothelioma, early diagnosis is crucial to allow for more, curative treatment options. Patients experiencing any of these symptoms should talk to their doctor right away, especially if they have a history of asbestos exposure. All forms of mesothelioma are difficult to diagnose and often confused for other conditions, whether common ailments like the flu or other cancers. For testicular mesothelioma patients, the rare cancer can easily be confused for other testicular cancers, like rete testis adenocarcinoma, or an inguinal hernia. In many instances, initial testing leading to a proper diagnosis occurs by chance after an irregularity is found during a routine physical examination or during another surgical procedure. Radiology, or medical imaging, is typically the first step in diagnosis. In these cases, doctors may perform a testicular mesothelioma ultrasound to observe any irregularities in the testes or scrotum. The ultrasound can show if the patient has any lumps or masses with 90% accuracy, as well as hydrocele. Radiologists may also observe thickening of the tunica vaginalis, which can help prompt further diagnostic tests. Studies have found that in most cases, the patient often only presents cancer in one testicle, with only a handful of instances with bilateral presentation. After imaging scans are complete, doctors may perform assays (blood tests) to better determine the cause of any symptoms and help detect cancer. For mesothelioma, doctors may look for particular biomarkers in the blood that may signal the presence of mesothelioma tumors. For all forms of cancer, a biopsy is the only way to get a definitive diagnosis. If the doctor suspects testicular mesothelioma or another form of cancer, the biopsy will be the last step of the diagnostic process. With the biopsy, doctors can look at the cell type, and determine staging and prognosis. A process known as immunohistochemistry, a staining technique to look at antibodies and biomarkers in the tissue or fluid sample, may also be used to find similar antigens and proteins that could be seen in the blood tests and help make an accurate diagnosis. Once testicular mesothelioma is confirmed, doctors will likely perform more tests, like a CT scan, to ensure there is no metastasis to other sites. These tests can also determine if the tumors in the tunica vaginalis are secondary tumors themselves. Mesothelioma patients overall face a rather grim prognosis of just 12 to 21 months, and testicular mesothelioma isn’t much improved. Researchers have found the median life expectancy to be about 20 to 23 months, though some patients have lived many years beyond their prognosis. Some reports have found a mortality rate of about 53% after two years, but data is still rather limited with so few cases. A number of factors can influence an individual’s prognosis, like the stage of the disease, cell type and age at diagnosis. There have been a few reported instances of benign testicular mesothelioma, but the majority of patients are diagnosed with malignant testicular mesothelioma with the epithelial cell type. Fortunately, epithelioid mesothelioma is the most common and responds better to treatment than the other common cell types. Recurrence is also a large factor in a patient’s prognosis. Testicular mesothelioma has a rather high recurrence rate, with some case reports estimating at least 52.5%. More than 60% of recurrences occur within two years after diagnosis and subsequent treatment, with 92.9% of patients with recurrence occurring within five years following diagnosis. In instances of recurrence, median survival was about 14 months, since most patients experienced distant metastasis. Since there are so few cases, doctors are unsure of the optimal treatment plan for testicular mesothelioma. Patients typically undergo multimodal therapy, most often of surgery followed by chemotherapy. Occasionally, radiation therapy might be recommended for instances of recurrence. In many reported cases, testicular mesothelioma is localized to one testicle, making it much easier to resect tumors. Researchers agree surgery is the best first-line treatment for testicular mesothelioma, as long as there is no or limited metastasis. In the majority of the case reports, doctors applied radical inguinal orchiectomy, a surgical procedure that removes one or both testicles and the spermatic cord. 10.5% recurrence rate has been found with orchiectomy. Patients experience a 35.7% recurrence rate with hydrocele resection alone. There may also be less radical surgical options for select patients, like a scrotal orchiectomy, which only removes the affected testicles or sometimes both testicles, or a resection of just the hydrocele wall. However, recurrence rates between the procedures vary greatly, with the more radical orchiectomy having an approximately 25% lower recurrence rate than less invasive surgeries. Metastasis can also impact if surgery is still an option for patients. Though many cases have seen localized disease, there have also been many reports of distant metastasis, especially with recurrent testicular mesothelioma. A study from the American Cancer Society detailed the common sites of metastasis. Chemotherapy might also be used in a multimodal treatment with surgery, or may be applied individually for patients who are not eligible for surgery because of metastasis. In most instances, doctors used the standard chemotherapy combination for mesothelioma of alimta and cisplatin, since research is so limited. Radiation has been used in a few cases, but its efficacy in reducing tumor size and alleviating symptoms varied widely among patients. With so few cases, there aren’t clinical trials available for testicular mesothelioma patients. Emerging treatments, like immunotherapy, have proven effective in other forms of mesothelioma, but are only available in clinical trials for now. Hopefully with further research, doctors will be able to get a better understanding of best treatment practices for this rare cancer. 2 Al-Qahtani M, Morris B, et al. Malignant mesothelioma of the tunica vaginalis. The Canadian Journal of Urology. Apr 2007; 14 (2): 3514-3517. 3 Chekol S, Sun C. Malignant Mesothelioma of the Tunica Vaginalis Testis Diagnostic Studies and Differential Diagnosis. Archives of Pathology & Laboratory Medicine. January 2012; 136: 1137-117. 4 Mrinakova B, Kajo K, et al. Malignant Mesothelioma of the Tunica Vaginalis Testis. A Clinicopathologic Analysis of Two Cases with a Review of the Literature. Klin Onkol. Fall 2016;29(5):369-374. 6 Plas E, Riedl C, et al. Malignant mesothelioma of the tunica vaginalis testis. Cancer. November 1998; 83: 2437‐2446.